One thing that everyone loves about camping is the prospect of a campfire. There's nothing better than sitting around a roaring log fire on a cool summer evening, enjoying a good book, sharing stories with family and friends or staring endlessly into the flames. 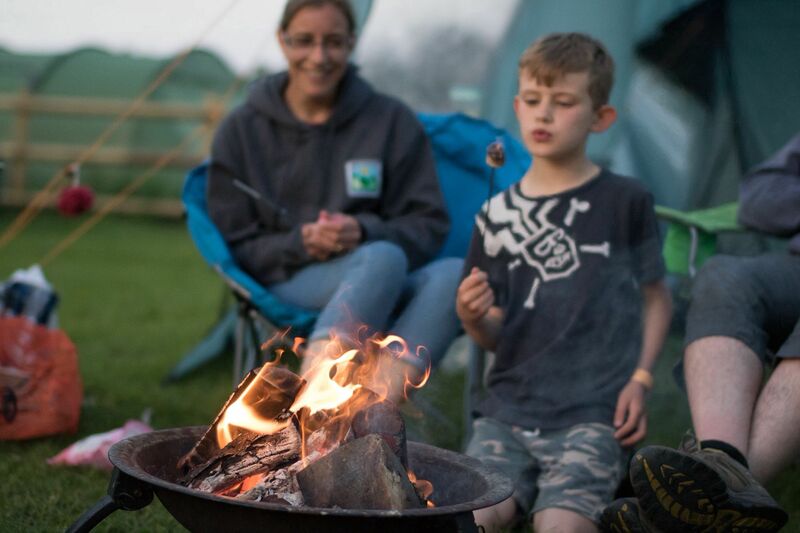 A good campfire warms the soul as well as keeping your toes and fingers snug and with more and more campsites allowing campfires nowadays it's super important that you know how to make the most of your fire pit. If you're not sure about where to start, then don't worry. We've put together a list of handy tips that should help your get your campfire going. You'll be toasting those marshmallows in no time! 1. Most importantly, make sure the campsite owner allows fires on site. 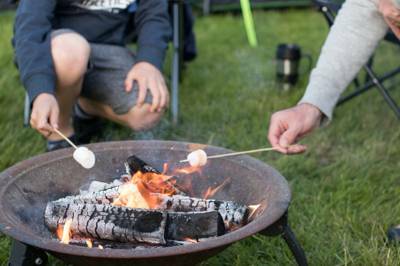 You can find a full list of campfire-friendly sites HERE. 2. Choose a site for your fire that is at least five metres away from your vehicle, tent or any hedgerows. You should avoid burning the grass, so either use a raised firepit or you can make a pit in the grass (if allowed). 3. If you're allowed to make your own firepit, cut an area of turf about 60cm x 60cm and approximately 10cm deep. Place the turf to one side, ready to replace before you leave the campsite. It’s a really good idea to border this area with large stones to prevent the fire spreading onto the grass. 4. Now that you have prepared your pit, take around eight dry kindling sticks and build a small jenga in the middle of your pit. Place a firelighter, ideally a natural firelighter down the middle, then place two or three smaller kiln dried logs at an angle over the jenga. 5. Light the flamer firelighter and leave for at least 10 minutes to get the all the wood burning through nicely. 6. Add three or four more logs, again at a vertical angle. This should be sufficient to ensure a good base to your fire. 7. If you intend on cooking over the fire, allow at least half an hour to get a good base and plenty of heat. 8. For cooking, allow the flames to die down and cook over the hot embers. By letting the flames reduce you avoid burning and blackening your food and there will be less smoke. 9. When you have all had enough and are ready for bed, ensure the fire has properly burnt down to a bed of ashes. If you have any concerns at all, pour water over the fire to fully extinguish although, though, generally, it will just burn itself out overnight. 10. When you leave your pitch, remove excess ash, then replace the grass turf and firm it with your feet to ensure the grass quickly starts to grow again. If you have done a good job, nobody should know that you have ever been there! a) Your logs must be really dry (below 20% moisture content) for a good, hot, continuous campfire. Kiln dried logs will most likely give you the best burn and are often sold at campsites. This not only provides the most heat output, but is easier to light and will have very minimal smoke. Dry hardwood logs won’t spit either. b)	Always add logs at a vertical angle and allow lots of airflow between the logs. c) Before you light the fire, consider any wind and its direction. If you do have any sparks or smoke, you don’t want these near your tent, vehicle or your neighbours. By Nic Snell, campfire and wood expert from Certainly Wood log suppliers.